As we all know, the biggest issue with Cloud systems is security, and it is nice to see that there are more and more options becoming available to solve this issue. We had a chance to talk with Nick Stamos, CEO and co-founder of the nCrypted Cloud, located in Boston. It should be noted that this is his 4th startup, and that the last one was also focused on security. The inspiration for the nCrypted Cloud was the case of presidential candidate Mitt Romney, when his Dropbox and mail accounts were hacked, and the most ridiculous part of the story is that the hacker only had to guess the name of the Romney's pet to enter his account. Main problem was that that the security system was not able to differ corporate from personal files, and because of that all of data was easily accessable. Stamoz tried to find existing solution for this problem, but has failed to do so, and simply decided to create his own and one year ago nCrypted Cloud was born. The service is capable of protecting your Dropbox account and has the ability to distinctly separate private from corporate data, and supports Windows, Mac, iOS and Android operating systems. The whole system is based on WPA2 encryption because they figured it is better to use something that is proven than inventing some sort of encryption themselves; to be precise they use AES 256 bit encryption as the base of their security and use Password Based Key Derivation 2 (PBKDF2) in order to protect and distribute the keys. Users can choose between private and corporate profiles, and between switching they must confirm that they are aware of the profile they are using, so if someone leaks the confidential information from the company, it will be very easy to find out who that was. Also there are several levels of security, so if user does not have enough permission to see the file, he can send the inquiry via e-mail to the owner of the file about granting access. Whole interface is very simple and similar to the Dropbox one, so if you already use the Dropbox to store files, you will have no problem adjusting to it. Also there are visual cues so you can see if the file/folder belongs to corporate or private part of the Dropbox folder, also you can see which level of security permission do you need to have to access it etc. System is based on complete privacy, so nCrypted Cloud will never know which password their users have. Private key is generated for every user from the combination of account id and users password, and the system uses public key to encrypt the data, but if you want to decrypt it you will be required to know your private key. One more thing that improves security is that the files you send will autodestruct after you view them, but they are also working to add an option so users can choose the time before message gets destroyed. 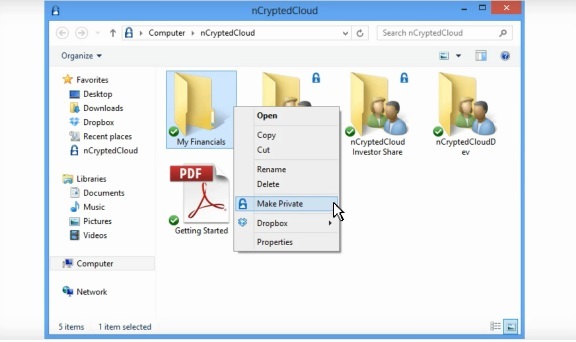 So if you want to improve security of your Dropbox folder, be sure to check the solution from nCrypted Cloud. How about if ncrypted Cloud is hacked ? All protected files will be seen then !